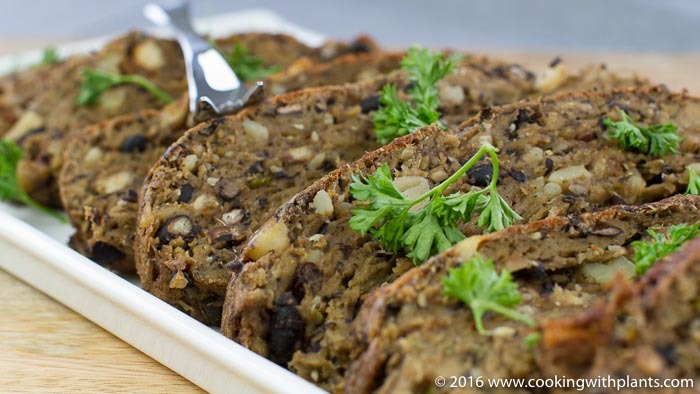 This black bean and potato seitan roast recipe is extremely hearty and filling, ideal for hungry families in need of comfort food! Best served with golden gravy, mashed potato and some baked vegetables! For this recipe you will need a large mixing bowl, a potato masher (if you do not like mixing by hand), a large bread pan, non-stick parchment paper, aluminum foil and a baking tray. Firstly, set your oven to 180 degrees C (360 F). Next take your large mixing bowl and add the toast, potatoes and black beans before mashing by hand or with masher. Now add the flakes, scallions, dried herbs, garlic powder, granulated onion and pepper before mixing again. Now add the rest of the ingredients in order before kneading the roast until well combined (about 2 minutes). The mixture should be like a stringy dough. Depending on the moisture content of your potatoes, beans etc you may need more flour or water to get the mixture to the right consistency. Line your bread pan with baking paper then fill with the mixture. Cover the pan with Aluminium foil and place in the oven for 30 minutes. After 30 minutes remove the foil and place back in the oven for a further 30 minutes. After the hour is complete you should be able to remove the roast from the baking pan in one piece. My roast was still soft on the sides so I wrapped it in fresh baking paper and foil, placed it on a baking tray and cooked it for a further hour flipping the roast at the 30 minute mark. Anja, is “gluten flour” what we call “Vital gluten” in the U.S? Hi Anja. For the mashing and mixing part, do you think it would work in a food processor? I cannot wait to make this! I would NOT put this in the food processor as it will overwork the dough and the gluten flour will not bind properly. Hi Anja is there any way I can make this gluten free? Possibly with chickpea flour but it won’t be the same. Sorry to be a pain but I’m a bit OCD with measurements and I really want to nail this recipe first-time as it looks so delicious! Just tried this, excellent!! Served it with vegan mushroom gravy & really enjoyed it! I have been eating plant-based for a while but couldn’t quite make the leap to vegan with your recipes I have done that now for about a week. I love your recipes. Can you tell me a little about your water consumption how much water do you drink a day? I don’t consciously think about how much water I drink in a day. I try to drink about 2 litres/2 pints of water. Looks very yummy!! I can’t wait to try to make this. I was wondering if this roast can be cooked in the crock pot, as we live in Florida and it’s already hot weather. I would like to avoid heating up the house for 2 hours by using the oven, but I will if I have to. I have seen some other recipes for seitan roasts cooked in the crock pot. Thank you for your time and I hope to find out about this. Sincerely, Annette Passwater. Hi Annette, I have never tried it in the crockpot. It may get too moist with the retained moisture in there. You would need to give it a try. If you do, please let me know how it turns out. Can you use stone ground whole wheat flour in place of the gluten flour? No, it’s not the same. The gluten flour becomes very stretchy and “meaty” textured.